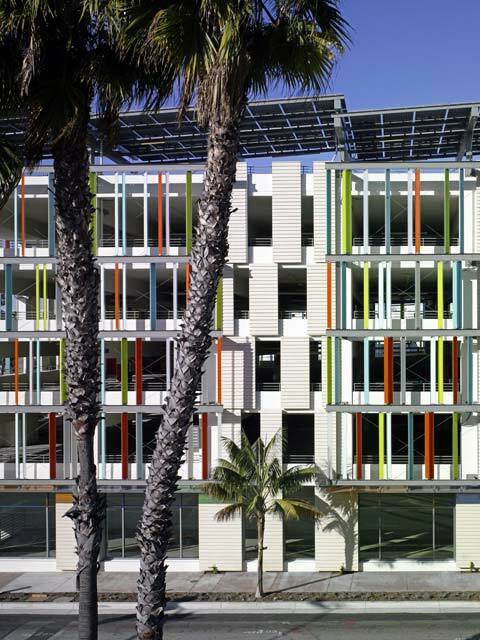 Santa Monica, California: The humble parking garage is humble no more with a bold design that makes it a sparkling destination point in itself - oh, it's LEED green, too. A recently completed master plan for Santa Monica’s Civic Center designates a new civic gateway at Fourth Street and Olympic Drive to the new district that includes the renovated historic City Hall (Donald B. Parkinson and Joseph M. Estep, 1939) and Courthouse (Maurice H. Fleishman, 1956), and the new Public Safety Building (Yazdani Studio/Cannon Design, 2003). A new civic parking garage, designed by Moore Ruble Yudell Architects & Planners (MRY), is now an integral part of the quadrant of civic buildings that visually unites the tableau of diverse buildings. Not least among the challenges was to “create architecture out of a utilitarian, common building type – one that is not generally associated with high design standards,” says MRY Principal-in-Charge James Mary O’Connor, AIA. 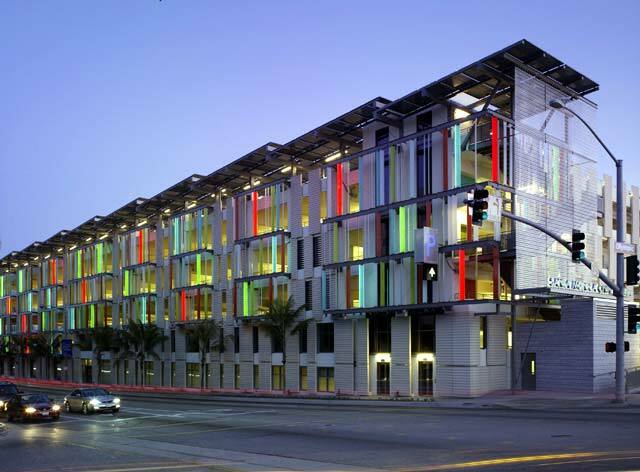 “The structure offers a visually memorable arrival point and gateway to the Civic Center.” The project also had to exemplify the city's commitment to sustainable design – this will be one of the first parking structures in the U.S. to achieve LEED Certification. The design brings a fresh perspective to a standard service amenity – the 298,786-square-foot structure includes 900 parking spaces on six levels above grade and two below grade – and takes it to a higher level that actually strengthens the urban fabric with street-level retail and café, spectacular views of the Pacific Ocean and the city, a garden, and a sense of personal safety. 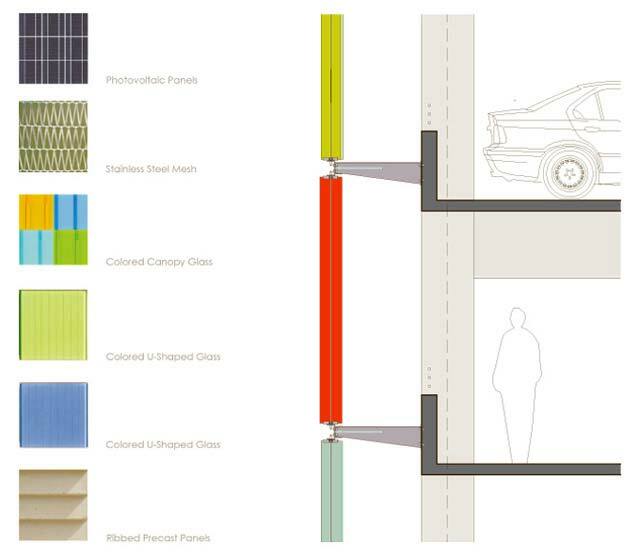 The varied amenities incorporated into the parking structure allow the designed mass to function beyond its service capacity. The four sides of the building acknowledge the individual urban contexts, thus serving as a fully designed urban presence. Small retail spaces at the pedestrian level expand the building's civic edge, creating a destination as well as a gateway. A lively café on the main plaza terrace will animate the pedestrian flow into and out of the heart of the Civic Center. The Zen garden – a commissioned artwork by Mark Lere – highlights both the inside and the outside of the building, making it more hospitable to the community than an ordinary public garage. 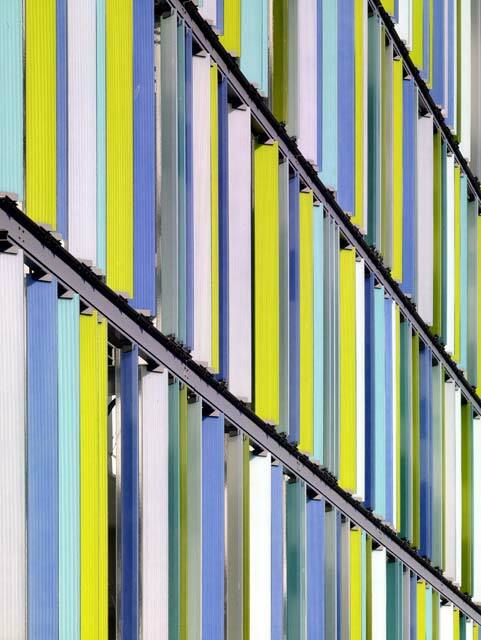 The building runs efficiently and sustainably. 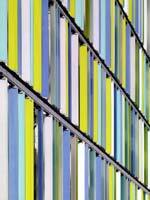 Photovoltaic panels on the roof and laminated to three façades provide much of the building's energy needs. 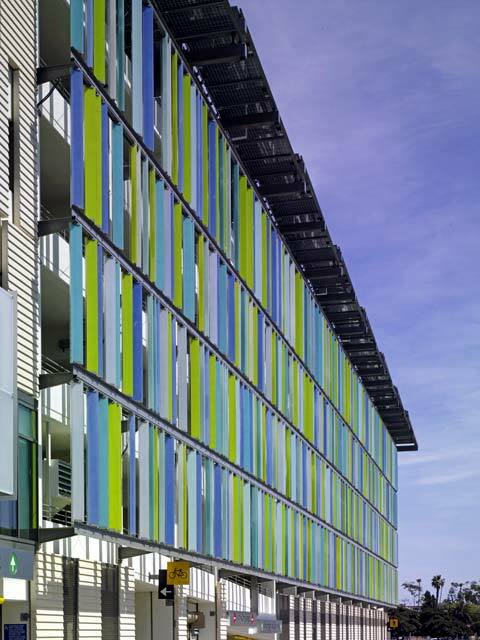 The array of angled photovoltaic cells accentuates the skyline and creates a memorable profile for the Civic Center. 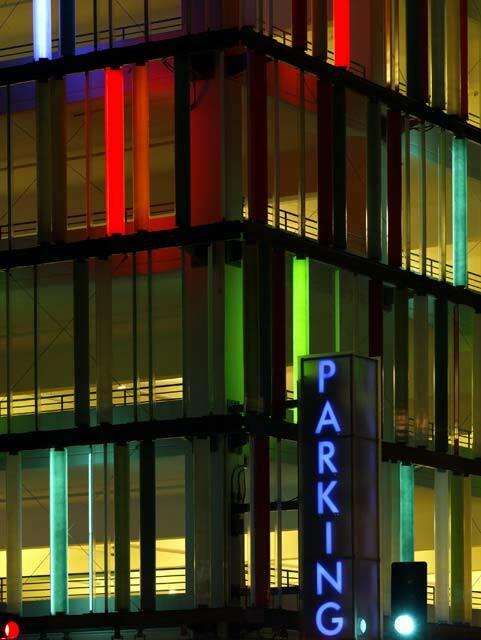 All façades allow natural ventilation and illumination to enter all parking floors. The ceilings are painted white to maximize the quality of light and airiness. 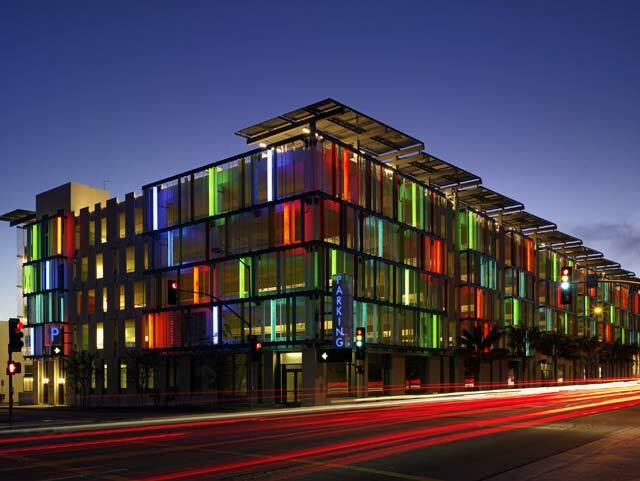 Multicolored glass panels allow daylight into the structure, decreasing the amount of artificial light that is generally needed for this type of building, and adding a glow to the interior by day and a luminous exterior by night. 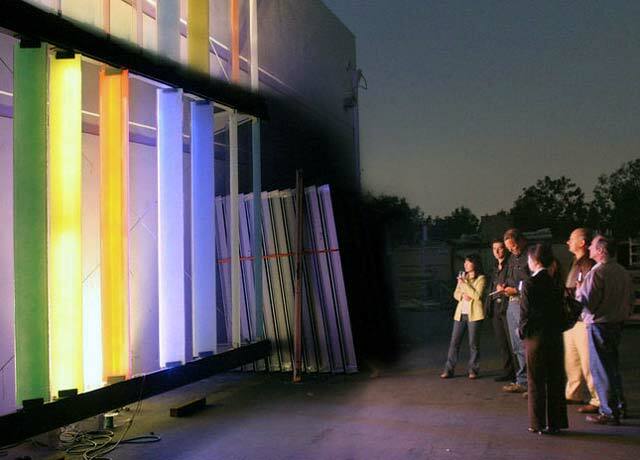 The structure becomes a sensor and vessel of light, colors, and patterns, ranging from transparent to translucent. 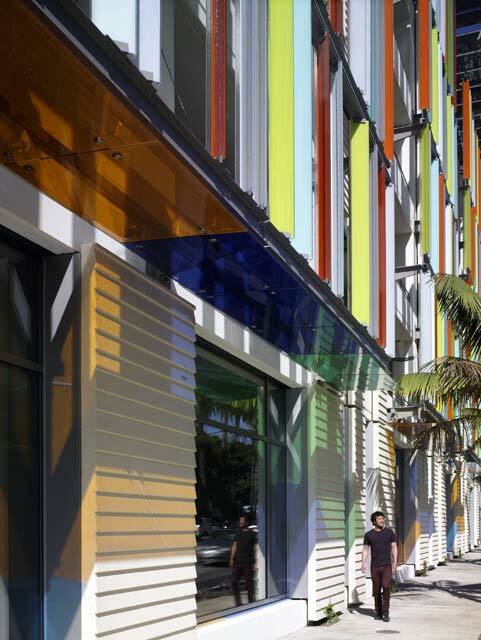 Other sustainable features include: a storm drain water treatment system; recycled construction materials and waste; low volatile organic compound paints and coatings; low-e glazing for heating and cooling efficiency; and energy efficient mechanical systems. The design incorporates several features that provide comfort, safety, and security for users. 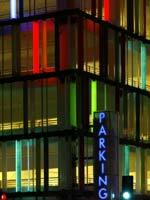 Parking is organized on eight floors, accessed via a centralized circulation spine. The elevator core and stairs are positioned with respect to the two major pedestrian paths in the Civic Center campus. 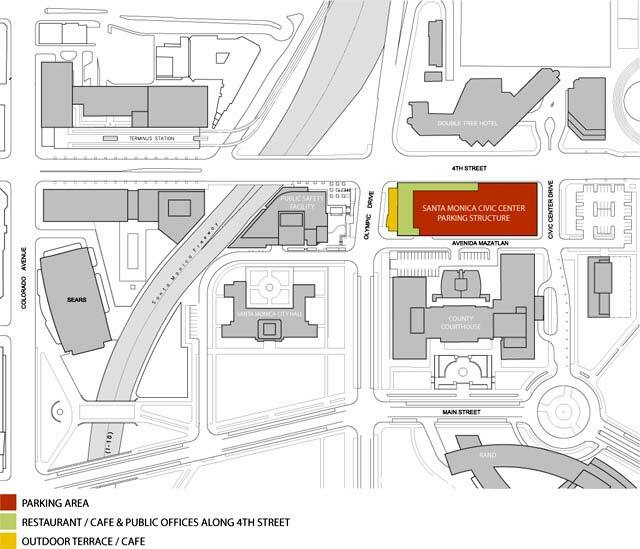 Access and exits have been consolidated at two corners of the building which serve as a control point to efficiently channel both pedestrian and vehicular traffic towards destination points. The reflective surface of the façade can be illuminated after sunset to glow as a shimmering curtain, providing defensible space through a pleasing ambient light. The design does not disguise the utilitarian nature of the building, but instead seeks to celebrate this aspect as part of the design aesthetic. Automobiles, from their colors, types, and movement, are integrated as elements in the overall design strategy. 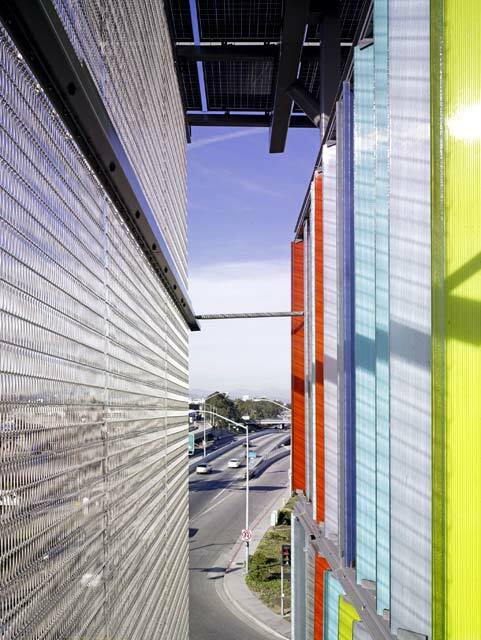 The design solution uses colored laminated glass channels, photovoltaic panels, ribbed pre-cast concrete panels, and steel mesh to render a unique civic presence. The integration of these materials makes the structure function as an urban curtain in its vibrant context. Pre-cast Contractor: Willis Construction Co. Inc.
Curtain Wall Installer: Woodbridge Glass Inc. 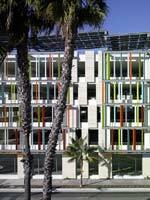 Photovoltaic Panels: RWE Schott Solar Inc.
Moore Ruble Yudell Architects & Planners (MRY) has built a varied body of work ranging from private residences to multi-million-dollar institutional, civic, and mixed-use developments. 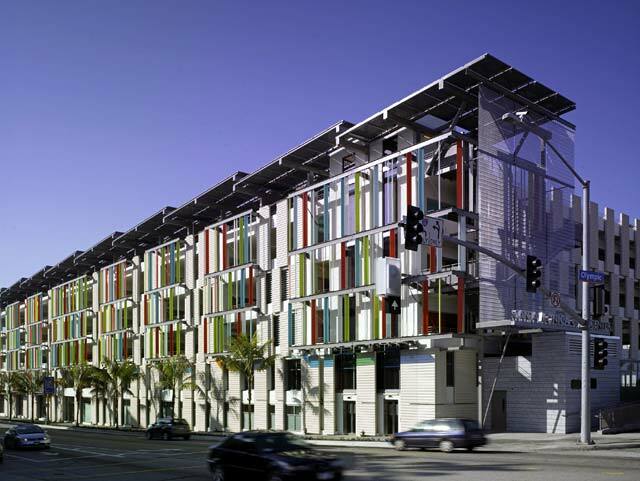 Founded in 1977 by John Ruble, FAIA, Buzz Yudell, FAIA, and the late Charles Moore, FAIA, the Santa Monica-based firm has a staff of more than 60, 25% of who have attained LEED Certified Professional status. Twenty years of working in Germany and Sweden have profoundly influenced MRY's concern for energy efficiency and green building design. Award-winning experimental works such as Tango Housing for Sweden’s Bo01 Housing Exhibition have informed initiatives for the new Santa Monica Public Library, which was recently awarded LEED Gold certification. In 2006, MRY was honored with the AIA Architecture Firm Award, the highest honor the National American Institute of Architects can bestow on a firm. San Jose, California: A student "village" makes a good neighbor in the heart of an urban historic district. Malmö, Sweden: Technology and environmental sustainability, along with natural light, playful colors and textures, and a garden, offer a civilized setting for urban dwellers.